[99 Pages Report] The carbon felt and graphite felt market size was USD 266.3 million in 2017 and is projected to reach USD 460.8 million by 2023, at a CAGR of 9.5% during the forecast period. The growing demand for high-performance batteries and increasing performance of carbon fiber in high temperature applications are driving the carbon felt and graphite felt market. The base year considered for company profiles is 2017; where information was not available for the base year, the previous year was considered. Secondary sources, such as Factiva, Hoovers, and Manta were used to gain insights into the carbon felt and graphite felt market. 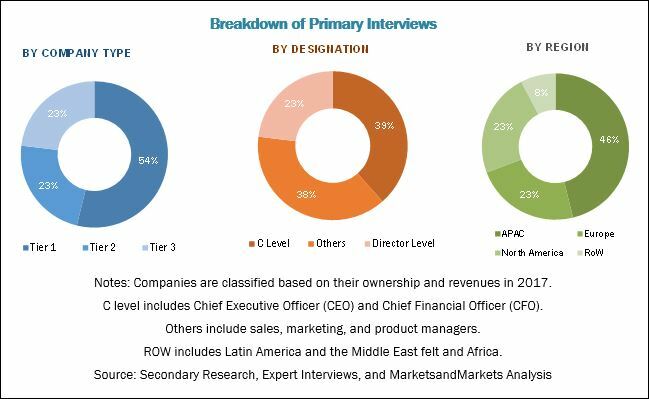 Experts from leading companies manufacturing carbon felt and graphite felt were interviewed to verify and collect critical information and to assess the trends in the carbon felt and graphite felt market during the forecast period. The top-down, bottom-up, and data triangulation approaches were implemented to calculate the exact values of the overall parent and individual market sizes. The carbon felt and graphite felt market has a diversified and established ecosystem comprising upstream players, such as raw material suppliers and downstream stakeholders, such as manufacturers, vendors, and end users of carbon felt and graphite felt. Leading players operating in the carbon felt and graphite felt market include SGL Group (Germany), Toray Industries, Inc. (Japan), Kureha Corporation (Japan), Nippon Carbon Co., Ltd. (Japan), Beijing Great Wall Co., Ltd. (China), Chemshine Carbon Co., Ltd. (China), CM Carbon Co., Ltd. (China), and Gansu Haoshi Carbon Fiber Co., Ltd. (China). This research report categorizes the carbon felt and graphite felt market based on raw material type, product type, type, application, and region. It forecasts revenue growth and analyzes trends in each of these submarkets. The carbon felt and graphite felt market is estimated at USD 292.7 million in 2018 and is projected to reach USD 460.8 million by 2023, at a CAGR of 9.5% between 2018 and 2023. The growth of the carbon felt and graphite felt market is attributed to the increasing demand from the furnace application. The carbon felt and graphite felt market has been segmented on the basis of raw material type, product type, type, application, and region. Based on the raw material type, the carbon felt and graphite felt market has been segmented into PAN, rayon, and pitch. PAN-based carbon felt and graphite felt holds the largest share in the market. On the basis of product type, the market is segmented into soft felt and rigid felt. The rigid felt product type accounted for a major market share in 2017, due to its large scale applications in furnace and batteries. On the basis of type, the market is segmented into carbon felt and graphite felt. Based on application, the carbon felt and graphite felt market is segmented into furnace, batteries, filters, and others. Furnace is the major application of carbon felt and graphite felt. The batteries application is expected to be the fastest-growing segment of the carbon felt and graphite felt market. Carbon and graphite felts find wide applications due to their properties such as high thermal insulation, broad operational range, chemical stability, and lightweight. APAC was the fastest-growing carbon felt and graphite felt market, in terms of value and volume. The increasing demand for carbon and graphite felts from the emerging economies and rising government spending on infrastructural projects are the main factors contributing to the market growth in APAC. 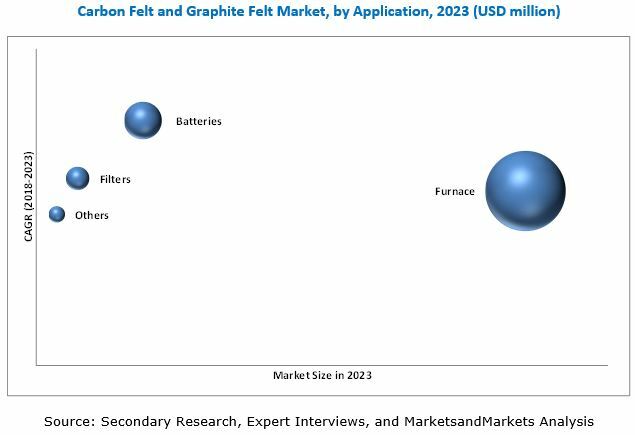 The increasing demand for high-performance batteries and improved performance of carbon fiber in high temperature applications are driving the carbon felt and graphite felt market. The absence of quality control in developing economies is restraining the market growth. SGL Group (Germany), Toray Industries, Inc. (Japan), Kureha Corporation (Japan), Nippon Carbon Co., Ltd. (Japan), Beijing Great Wall Co., Ltd (China), Chemshine Carbon Co., Ltd (China), CM Carbon Co., Ltd. (China), and Gansu Haoshi Carbon Fiber Co., Ltd (China) are the key players in the carbon felt and graphite felt market. These key players offer a wide range of carbon and graphite felt products to strengthen their competitive positions and cater to the growing demand in the furnace, batteries, and filters applications. SGL Group (Germany) is among the major player in the carbon felt and graphite felt market. The company is focused on expanding its production facility to cater to increasing demand for carbon and graphite felts. 11.4 Nippon Carbon Co., Ltd.
11.5 Beijing Great Wall Co., Ltd.
11.7 CM Carbon Co., Ltd.
11.8 Gansu Haoshi Carbon Fiber Co., Ltd.
11.11.1 Sinotek Materials Co., Ltd.
11.11.3 Buffalo Felt Products Corp.
11.11.6 Anshan Sinocarb Carbon Fibers Co., Ltd.